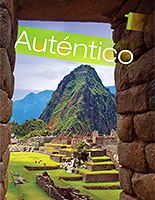 Abriendo paso is a highly respected two-volume program specifically designed to address the needs of high school students in upper-level study including those preparing for the Advanced Placement Spanish Language and Culture Examination. 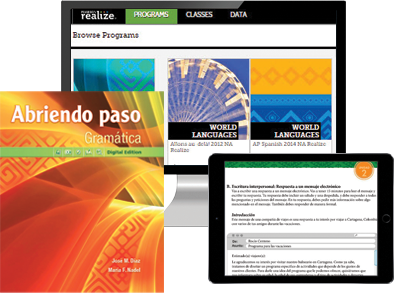 Abriendo paso and AP* Spanish: Preparing for the Language Examination are the most widely used and trusted programs written specifically for success on the AP® Spanish Language and Culture Examination. 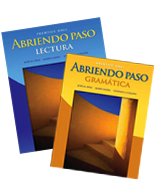 Abriendo paso ©2014 is ready to prepare your students for the new exam and Temas y lecturas ©2014 is the ideal core textbook for your class! The Table of Contents is 100% aligned with the Themes, Essential Questions, and Recommended Contexts in the Curriculum Framework. Each chapter is developed around authentic reading selections supported by outstanding pre- and post-reading activities. At the end of each chapter, students build skills in the modes of communication through creative and engaging tasks. 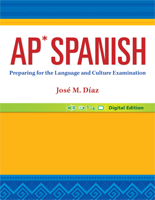 In addition, the end of the book provides focused test practive organized around the six themes. 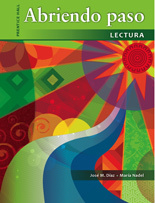 Gramática ©2014 provides a thorough review of Spanish grammar and offers a balance between communicative usage and core practice. Assignable eText activities: same activites from Student Edition and the practice tasks feature auto-graded activities, open-ended writing activities, and speaking tasks that can be recorded online using RealTalk!